Keng Eng Kee Seafood restaurant at Alexandra Village used to be my family’s favourite Cze Char place. It has been a while since our last visit here so we decided to drop by for dinner last week. Besides the good food, some of the regulars probably go to Keng Eng Kee Seafood because the Zi Char Stall has an air-conditioned dining area just opposite the coffee shop. It was a tough call between the Chilli Crab and Salted Egg Yolk Crab, but eventually we went for the latter as it was apparently a signature dish of Keng Eng Kee restaurant. 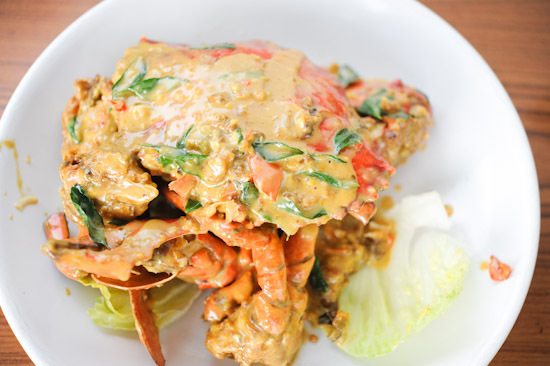 The sauce of the Salted Egg Yolk Crab ($39/kg) was very thick, and had a subtle spicy taste. I probably had better salted egg yolk crabs elsewhere before, but this was pretty decent. We wanted to have Hot Plate Beancurd but it was not available on Keng Eng Kee’s menu. But it was not so bad since the Claypot Beancurd was a good replacement. 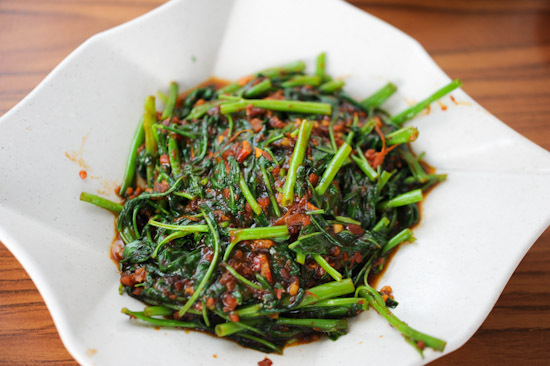 The Sambal Kangkong was well done. It was spicy but not to the extent of being tongue-numbing. The small portion comes at $6. I was quite disappointed that Sweet and Sour Pork is also not available under the Pork section. But there are interesting options like Golden Pork Ribs, Coffee Pork Ribs and Claypot Pork Liver to choose from. 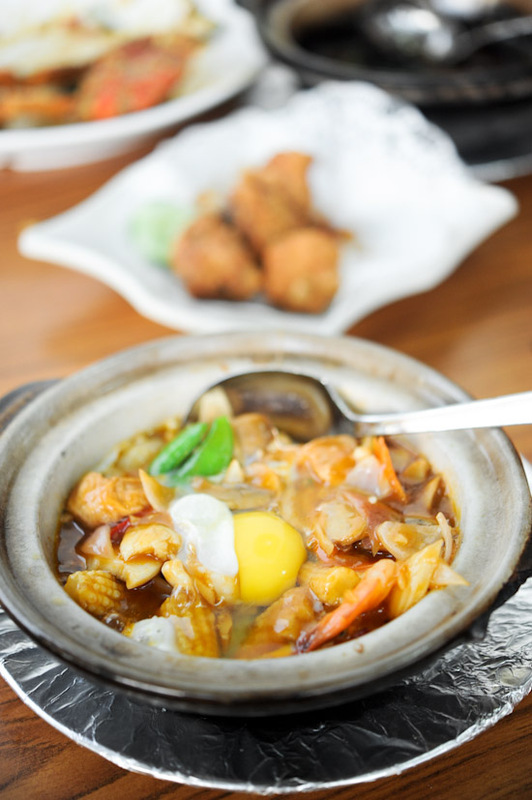 We were intriguied by the Claypot Pork Liver as not many cze char restaurants serve it. Just look at all the oil used to cook the liver! 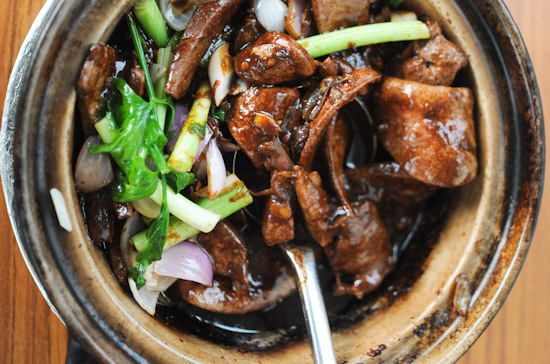 The Claypot Pork Liver ($8) is definitely not for the faint-hearted. But it sure was tasty. 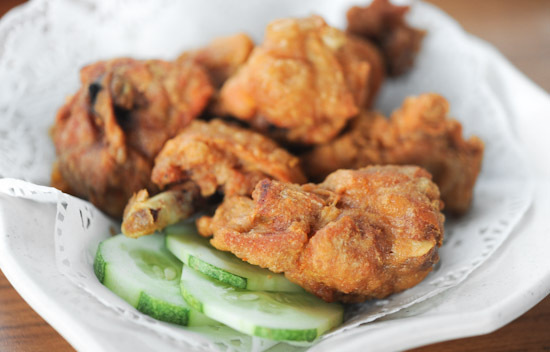 Prawn Paste Chicken is a very popular zi char dish and there are different variations for it. I’ve had very good Har Cheong Kai before, so I was actually looking forward to the ones at Keng Eng Kee. Unfortunately, the Har Cheong Kai ($8) here was quite disappointing: the chicken was very small, and I felt that the shrimp paste marination was rather weak. I’d probably go for the Crispy Roasted Chicken or the Marmite Chicken next time. I was quite impressed with the waiting time at Keng Eng Kee Seafood. The Cze Char restaurant was almost packed when we were there for dinner, yet they managed to serve most of the dishes within 10 minutes. The food at Keng Eng Kee Seafood was pretty good and it was a bonus that everything came quickly. Prices are what you’d expect from a typical zhi char place, but the portions served were slightly smaller. This place is my family regular dinner place, we love their claypot pork liver so much we need 2 to satisfy 6 of us. Juz had a hearty dinner there. The auntie that took our order was very considerate and even stop us from ordering too much!! Even though it was peak hours, The staff are still polite and attentive.There was no shouting like other Tze Char restaurants.